Gogeta (ゴジータ, Gojīta) is a character who is the resulting fusion of the two highly powerful Saiyans Goku and Vegeta when they perform the Fusion Dance properly. His voice is a dual voice that contains both Goku's and Vegeta's voices. Gogeta is famous for his amazing power and speed, and is regarded as one of the most powerful characters in the Dragon Ball franchise. His Potara Fusion counterpart is Vegito. Vegito (ベジット, Bejitto; "Vegetto") is the immensely powerful result of the fusion between Goku and Vegeta by the use of the Potara Earrings. 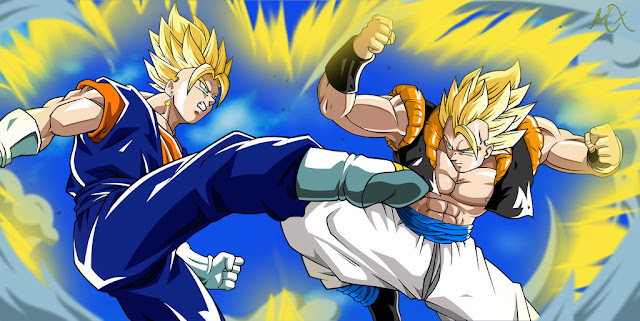 Vegito is regarded most for his immense power and speed, and is the most powerful character in the Dragon Ball manga. His Fusion Dance counterpart is Gogeta. He was absorbed by Super Buu in the Majin Buu saga, defusing him back into Vegeta and Goku. Goku and Vegeta, two different people, two eternal rivals, two friends... joined together, but in two different ways! 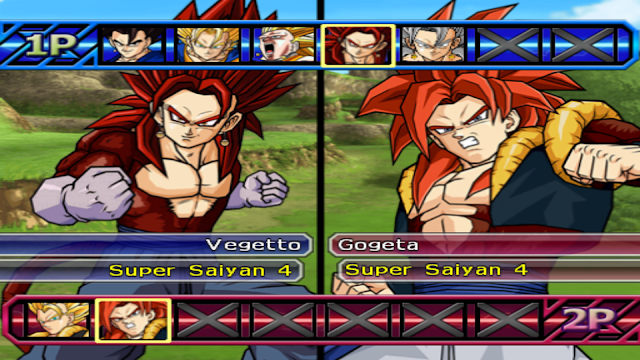 Gogeta appears in Dragon Ball Z: Fusion Reborn, Vegito in the official storyline of Dragon Ball Z (Majin Buu saga) and all Super Saiyan 4 in Dragon Ball GT... but in Budokai Tenkaichi 3 we can mix all together! Who is stronger? Who will be the winner?